I have underestimated the vastness of this country and overestimated my ability to endure the I-10 through back-to-back 500-mile days of rain and fog. Even though I haven’t tolerated the last few days in particularly good humor, the GT has gone happily from sea to shining sea — bringing rain with her wherever she travels. We haven’t ventured out of the car much and I blame it on the weather. Yesterday at the end of the I-10, we turned north onto I-95 and have stopped for a few days on Amelia Island in Florida just north of Jacksonville. We have now dipped a wheel in the Atlantic and Pacific Oceans. With the relative calm of the Atlantic outside my window (as compared to the raging Pacific back in Fortuna, California), I need to bring you up to the minute. We left San Antonio without visiting the Alamo. We did drive around it but there was no place to park for a suitable and quick photo op. All the vistas were blocked by buses waiting for the tourists lined up to go inside. We headed out for Houston. Between San Antonio and Houston, there was just . . . nothing. The little towns we did dip into were bleak and dismally empty. Main streets with boarded up store fronts had been killed by the Interstate, just like we witnessed on Route 66. There was little to see and less to write about. For that, I am sorry. Maybe there’s not completely nothing in that stretch of Texas . . . there was a quick road-side stop for some necessaries. The barbecue was good, but I feel we could have done better if we had only known where to look. After lunch we aimed for Houston, some coffee and a catch-up with family. Then we moved on to our final destination for the day — Lafayette, Louisiana — crossing the Houston skyline in gray twilight. Stats on the day: 412.6 miles, no vista points. We’ve taken to searching out boutique hotels in downtown neighborhoods to see what’s going on in various corners of the world. Staying out on the I-10 would be like staying in anywhere-America with hotel chains and big box stores and we didn’t want to do that. The cities where we have stayed are all making efforts to revitalize themselves by creating interesting destinations. In some towns, the hotels are an active part of the scene. Bakersfield is doing a commendable job of bringing a fresh breath to its downtown. The Padre Hotel is clever and fun. The Camino Real in El Paso has a tougher job trying to inject needed enthusiasm to its city. San Antonio’s Riverwalk was rocking and needed no help at all. We recommend San Antonio as a vacation destination and worth more time than we could give it. Above all though, is Lafayette, Louisiana. Lafayette is a gem — the most interesting and vibrant town we’ve visited on the I-10, so far. 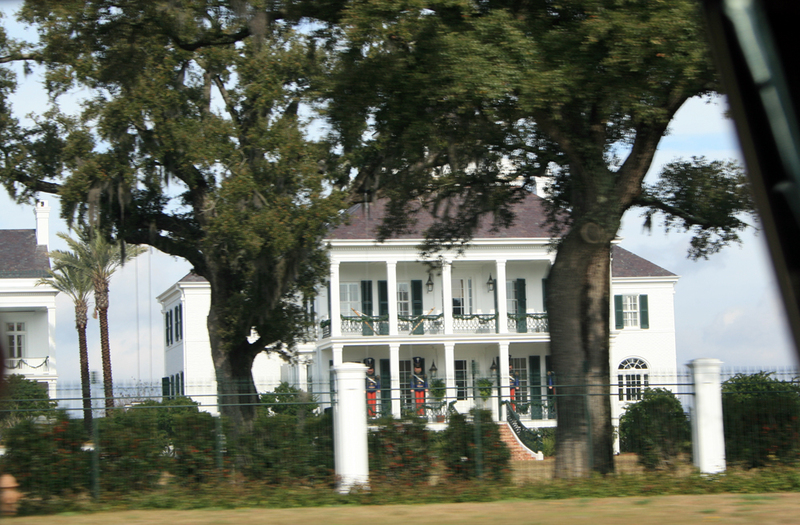 We stopped short of New Orleans and chose to stay in Lafayette so we could drive Route 90 during the day. Route 90 was replaced by the I-10 and scoops down from Lafayette through the small towns of Cajun Country and back up to New Orleans. We stayed in The Juliet, a lovely hotel in the heart of the downtown area. We arrived late but restaurants were still open. Finding dinner wasn’t a problem. The next morning we hit The Hub City Diner for a delicious sausage scramble with biscuits and grits. Oh, my. It was still raining outside but my attitude was improving. 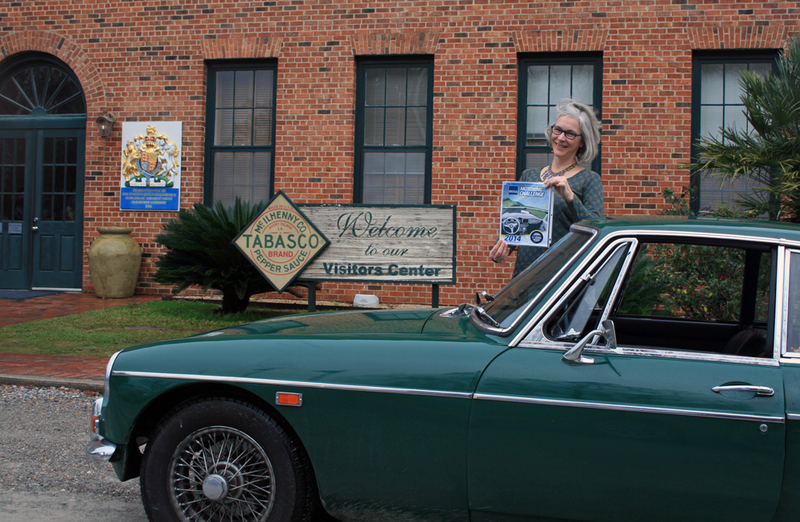 Our first stop was actually a Route 90 detour — the Tabasco factory on Avery Island for a tour of the plant and some tasting. The rain had abated for a moment. Tabasco factory, Avery Island, Louisiana. The rain started slamming again just as we left Avery Island. 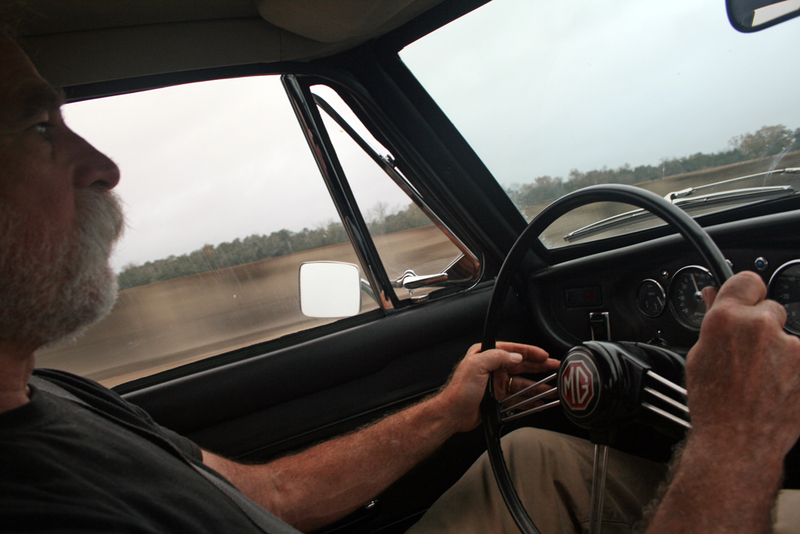 I mentioned to Googie that my wiper blade seemed to be working more and more poorly as we logged more and more miles. At that very moment, the blade leaped to its death. There was nothing left as the arm swung uselessly back and forth in front of me. Now, I was limited to taking photos out of the side window. My point of view was ever narrowing. All the way down at the bottom of Route 90 surrounded by water-logged sugar cane fields is Morgan City. The afternoon started slipping into evening and we were expected in New Orleans for dinner. 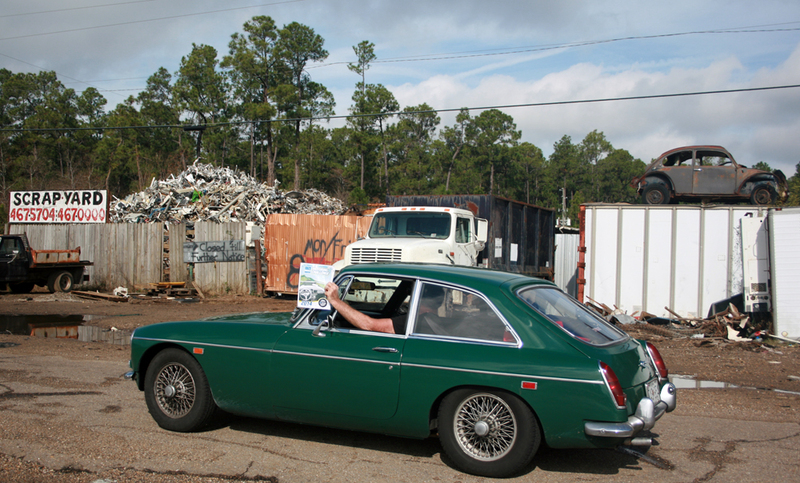 Lafayette, Louisiana is a town that demands more of our time and I expect we will return to explore it further. This was the nicest day in the past two. We ended it in New Orleans with family and friends and a tasty turducken dinner. Stats on the day: 208.7 miles, one lost wiper blade and tasty, tasty meals. First order of the day was to repair the passenger side windshield wiper with the replacement Googie had bought in California. One broken drill bit later and the job was done. The sun was struggling to cut through the clouds as we left New Orleans on our way to Jacksonville. First stop, Mississippi. When the sun did break through, we left the I-10 headed for the Gulf of Mexico and Route 90 once again, to see what was to be seen there. What we saw was a state of contrast. Not even the junk yards can survive here. Note the “Closed till further notice” sign. When we reached the Gulf Coast, we saw wealth that had not been destroyed by Katrina in the town of Pass Christian. Further on, we passed a working fishing fleet. 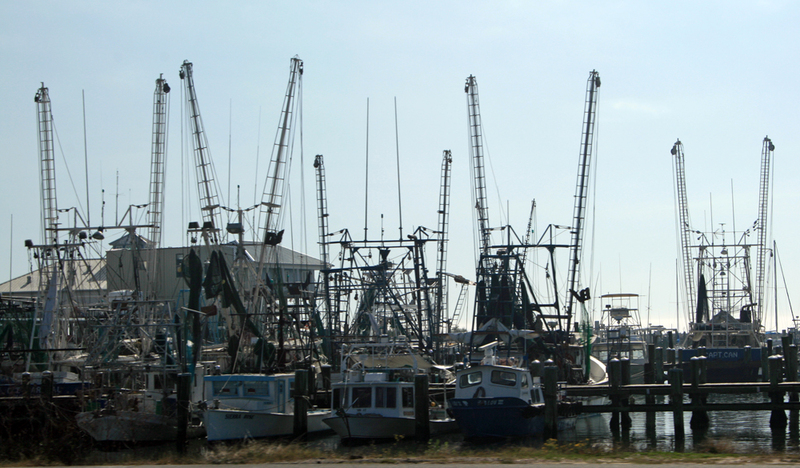 A working fleet in Gulfport. 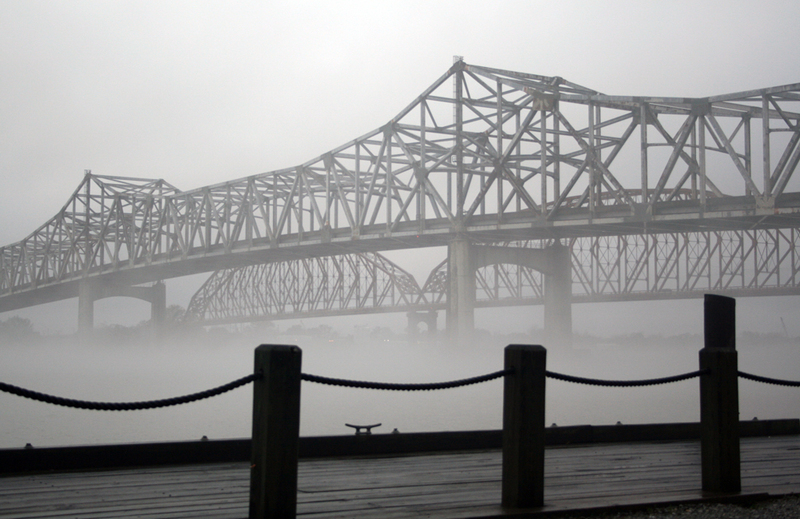 Shortly after Gulfport, the fog moved in followed quickly by rain. We headed back to the I-10 and Alabama where we didn’t get out of the car in the downpour. We ended the day somewhere in the Florida panhandle. Stats on the day: 305.6 miles, more rain. After spending New Year’s with the boys, we’ll be Baltimore bound on Friday. I’m glad that y’all took the time to visit Avery Island. 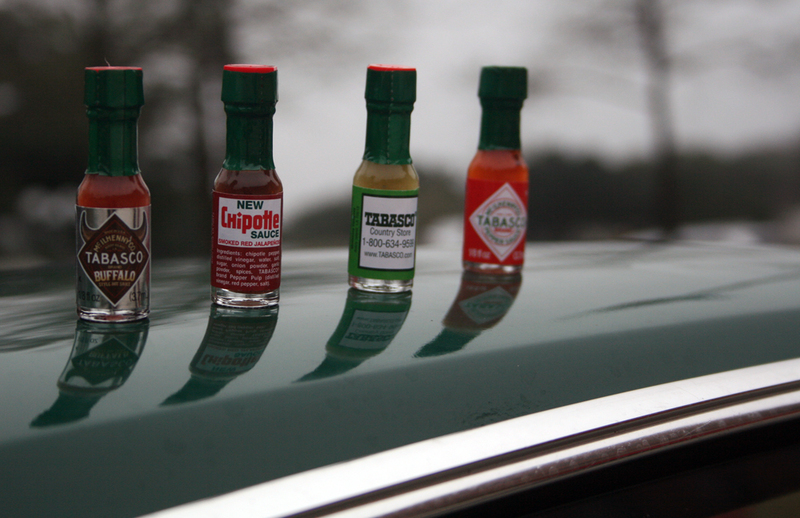 I bought all kinds of unnecessary Tabasco objects. It was well worth the visit between the rain drops. Great to hear the Wayward Wanderers are alive & kickin’! That beach is looking pretty good from up here – enjoy the R&R and brace up for I-95. Looking forward to the debrief. The beach is looking pretty good from here, too. Must say. And the stars in the sky. Not much else to tell, except for the issue with the radiator . . . . So glad you are having a nice R&R with the boys in FL…hope the rain is now history!! 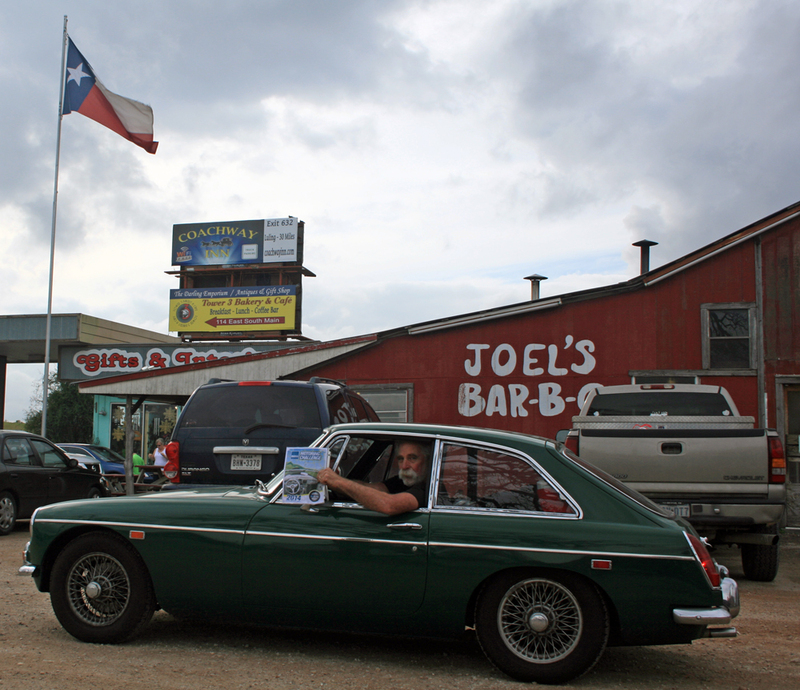 One “O” ring and one windshield wiper blade is not bad….and I like the view you had all through Texas!! Not bad, not bad at all. The little green girl is a happy traveler. I have enjoyed every post; what a trip! Sorry about the rain but glad that the car is doing so well. Enjoy your New Years. Hello to Tommy and David. See you in Baltimore. I’m glad you have enjoyed the posts. It has been a once in a lifetime trip. Gotta think of something to do next. HAPPY NEW YEAR – You deserve some R &R after your rain and fog venture. Well, now you know the green machine is water tight. Enjoy. We have us a mean, lean and green machine. She’s doing great so far and we’re still having fun. Am on hold with Tech Support (Vonage), so I’m binge-blog-reading. Ah, here they are now! Modern Marvels or some other channel did a story on Tabasco and the corrosiveness of the brew on their forklifts – they only last 15 months.